The majority of Nicolas Cage’s recent output has been direct to DVD so it’s good to see him returning to cinemas in ‘Mom and Dad’, a comedy horror with a good dose of satire. Let’s be honest, you probably came to see this expecting to see a good amount of Cage going full on ‘Nic Cage’ (especially if you’ve seen the trailers), and no one does over the top crazy just like Cage. The good news is that this is one of his most enjoyable performances in a while, a completely unhinged and appropriately over the top display that I came in hoping for, and got in spades. The film doesn’t overstay its welcome at just shy of 90 minutes and it’s a really fun piece of genre fare from director Brian Taylor. Cage plays Brent Ryan alongside Selma Blair as his wife Kendall, a suburban couple with two children (Anne Winters and Zackary Arthur) who live in a nice home in a nice area. Underneath this ‘normal’ exterior the cracks are beginning to appear with Brent and Kendall’s relationship showing strains as both start to lament on their age and how they ended up where they are now. Meanwhile, a strange phenomena starts to affect parents in the town, where the static from television screens turns parents against their children, unleashing murderous impulses which are showcased in gloriously absurd ways. It’s a classic switch around on the expected dynamic of parents protecting children at all costs, and the film manages to showcase the horror of this whilst also making it comedic, largely through some inspired song choices, great sound design and Blair and Cage’s deranged performances. It moves into essentially a home invasion thriller at this point, albeit the invaders are the parents, with the children trying their best to keep their parents at bay. By the time Cage’s parents arrive for a previously arranged dinner (Lance Henriksen as his dad! ), it’s all so off the scale mental that you just embrace the carnage being thrown at you on screen. 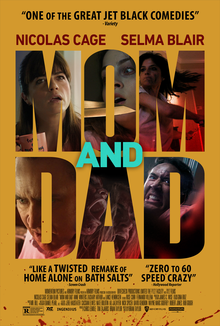 I had a blast watching ‘Mom and Dad’ and I felt it mostly hit the mark with its satirical points whilst effectively managing the balance of violence with absurd comedy, and if you are in any way a fan of Nicolas Cage’s shtick, this film is absolutely made for you!